An unsurpassed collection of over 550 superb images that represent the world's best photographers from the mid-nineteeth century to now. Deflected tracer bullets cut through the darkness on a military range close to Gotenba in Shizuoka Prefecture. In 1999 Kuroda may have been interested in military matters, but he was also intrigued by the representation of space. The tracers at Gotenba curve into the night sky and give some impression of its immensity. In other and later pictures his tendency has been to represent pictorial space as if it were made up of enclosures furnished by bits and pieces of geometry. He refers to rations for his pictures, which are usually in landscape format, and often relate rectangles to squares and to other rectangles. His subject is the cosmos, sometimes thought of as an ordered whole pointed to by tidy urban geometries and sometimes as mere immensity of the kind experienced on the firing range at Gotenba. In the cosmos there are also centres of energy, represented by creatures who congregate and converse. Koichi Kuroda is a tantalising artist in the sublime mode. His statements, from the Akaaka Publishing web site, enhance the mystery: ' Stil, what kind of ploofs can I rely on, in order to drink water?' 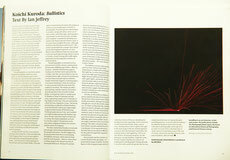 The book in question is Ballistics, published by Akaaka in September 2008, and somewhat based on an exhibition of 2005. 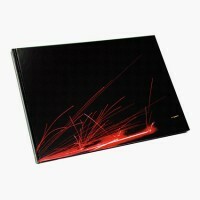 There is no text in the album, just 77 pictures, printed on a large scale – and all of them landscape format. There are several sets and pairings which work collectively. The Japanese have a recent reputation in photography for random product, splurge runs of almost anything at all, but Ballistics is something else again – very judiciously considered and challenging at all points. The title derives from an 'Arms Project' undertaken in 1999 on arms and the acts of arming, although the book, despite some apocalyptic talk on the web site, seems calm enough. The photographer, as reported in poetic fragments by Akaaka, reads like a man apart, an intuitive artist just got in from the wilderness. Here is one description of his encounters with the world in which we live: 'On the street, in the metro, on the slopes of a mountain, in a shopping mall, I closed in and opened up myself, just like being a material'. He committed himself, he seems to be saying, to the moment and to everything in it, giving himself little space for reflection. The pictures may have been taken intuitively, in the grip of immediate impressions, but the book itself dose seem to be carefully selected, organised and universal in scope. The right word might be dialectical, for Kuroda's pictures work one in relation to the others; and many of them play on the difference between the empirical and the transcendental. The series concludes, for instance, with a set of four pictures taken at Asagaya,Tokyo, on Saturday 31 July 1999, of a few people on the fringe of a darkened site watching heaven knows what kind of bright emanation in the distance beyond the frame. He is also unusually careful about location and dating, as if the pictures were part of a process. Kuroda, like the rest of us, lives and acts amongst mere materials. In that set of pictures from Asagaya there is a lot of worn earth in the foreground, along with gravel and tyre tracks – just like some of those paintings of the German earth by Anselm Kiefer. Time and again in the book Kuroda states the empirical position as you would expect to find it in photography. He prints pictures which relate to incident, along with others which are of site, scenes, used landscapes: photography's usual modes. In one characteristic example of an 'incident' a casualty lies bleeding on a street in Sao Paulo in Brazil in March 2008. A few policemen complete the event, although he shows only their boots and trousers. The scene is an episode from a longer story which can be well imagined. In pictures of 'site' there is more evidence of land use and activity. In one such quite typical image taken in winter in Toronto,a road crossing with traffic lights represents normal usage plus evidence of small accidents. This photographer is interested in how pictures work on their viewers, putting them at their ease, fulfilling expectations,offering rewards – and then withdrawing support. In phase one, the basic level represented by 'incident' and 'site', we are invited to exercise everyday forensic skills. In front of such pictures we know that we are perceptive and level-headed. What then happens in photography's more advanced phases is that we continue to rely on proven methods even when the evidence is eccentric. The results are often disconcerting, and the majority of Kuroda's pictures operate in this second or further phase. In one pairing, taken in a public park in Shinjuku in Tokyo on Saturday 5th July 2003, a picnicking couple rest on a blanket in the shade of some trees. They are watched by a flock of crows, hoping for scraps. The facing picture shows a collection of black feathers stuck into the turf, making up a lightweight sculpture in the manner of Richard Long. Thinking in plain terms of 'site' and 'incident' one might wonder just how the feathers got there, for the crows don't look as if they are moulting. Was there a dead bird, and was Kuroda the sculptor? The pictures invite speculation verging on fantasy,the motives and the nature of sculpture. The trick, mastered by Kuroda, is to include just enough commonsense material to lure the analyst into action. The first stages may be easy but after that there is no knowing. The Ballistics pictures, which seem to have been his starting point – taken in 1999, show a military range in the Mount Fuji area of Yamanashi Prefecture. The book's own list of works mentions Gotenba/Shizuoka and shows that nearly identical pictures were taken over several years. The pictures were taken in darkness, meaning that somewhere in the obscurity Mt.Fuji rises up unseen. Perhaps by now Mt.Fuji can only function effectively as an idea, with the actuality hardened into a cliche. A thought-provoking note from the exhibition of 2005 reminds readers that Aokigahara Forest, in the environs of the mountain, is the site of a famous suicide spot and that the poison gas cult of 1995 had its headquarters nearby. Kuroda must have had an aura in mind and the hidden sense of the place, in the manner, say, of lain Sinclair musing on hidden and ancient forces abroad in London – Mt.Fuji in relation to London Orbital. The ballistics pictures, quite spectacular and evocative, feature tracer bullets impacting on a target and ricochetting into the night sky. In some cases missiles track across the night past tiny pinpoints of light. Night-firing would have to be undertaken with night-sights, and Kuroda, who would only have been able to see the resultant firework display, might have had his own defencelessness in mind. Akaaka's laconic web site dose suggest 'that the traces of the missiles could be our trails we have drawn, or ones we will follow'. 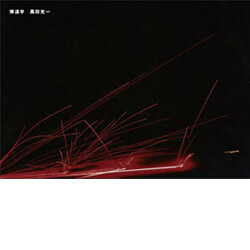 Kuroda, on the evidence of Ballistics, is preoccupied by the idea of searching. A lot of the pictures hold extensive areas of darkness, barely articulated, although if you look hard enough you can just about make something out. Or there are bleached skies and buildings which are hard to decipher, plus impenetrable thickets, some of them in Brazil which he visited in 2008. In Suzhou in China in 2006 he took two pictures of a garden of thick grass from which a young girl, with some difficulty, pics some examples. How did she make a selection from so much identical herbage? We select, the picture implies, from what is nearest and that free choice is an illusion. Or he may be attracted by the idea that we are drawn to difficulties, for the patch of vegetation is guarded by a metal fence. His principal searchers, however, are crowds drawn to the apocalypse…or to some kind of major revelation. The shadowy figures in the Asagaya images, which end the collection, look as if they are attending the landing of an alien spaceship. In two extensive crowd scenes from Kudan, Tokyo, seen in 2002, the big event is out of sight to the right. In the next image in the set another Japanese crowd at a fun-fair look glum and restless for nothing seems to be happening. Left to our own devices, his pictures propose, we will pic grass, arrange feathers, study the scene at arm's length, together, by contrast we would prefer a blinding light. Perhaps Kuroda is an artist with a political agenda, but he may simply have the knack of making thought-provoking pictures. From the sketchy evidence provided by Akaaka it seems that Kuroda came late to photography, at the age of 30 in 1998. For most of his contemporaries it seems almost to have been a way of life and of seeing, whereas he acts like someone with preconceptions, ideas in mind.